With his bestselling book, The Paleo Solution, Robb Wolf helped hundreds of thousands of people lose weight by eating a low-carb Paleo diet, but Paleo is only a starting point, not a destination. Now, he'll share a more customized way of eating that may be the key to permanent weight loss and better health. You'll start with Wolf’s 30-Day Reset to help you restore your body's blood sugar levels, repair your appetite, and reverse insulin resistance. There are more than 70 delicious recipes, detailed meal plans, and shopping lists to aid you on your journey. Wolf also includes meal plans for people who suffer with autoimmune diseases, as well as advice on eating a ketogenic diet. Once you've completed this phase of the plan, the unique 7-Day Carb Test will help you determine what amounts and types of carbs you can tolerate. "You're not crazy, weak, or lacking willpower... it's the food! 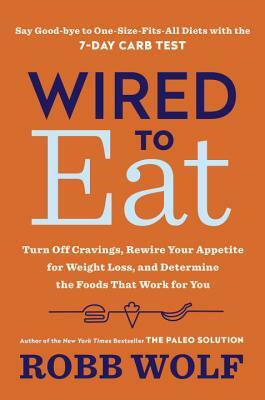 Wired to Eat digs into the science to show you how the "healthy" foods you've been eating are keeping you sick, tired, and overweight, and provides an effective, easy-to-follow action plan to help you look, feel, and live your best." "Wired to Eat goes way beyond looking at food from a nutritional perspective. Robb Wolf reveals how food serves as information, actually influencing the expression of our DNA….an incredibly user-friendly program that’s in line with the most leading-edge research available. A landmark guide for regaining and maintaining health." "Wired to Eat is a scientifically sound and very easy-to-understand road map to optimal health. Robb Wolf presents clear, concise tools and strategies you can use to lose weight, control blood sugar and inflammation, and customize your diet. I highly recommend this groundbreaking program for anyone who has struggled with weight or health issues or who simply wants to get to the next level of well-being." "Wired to Eat offers a cutting edge view that goes way beyond paleo and proves that resetting your metabolism is not about which foods you eat, it’s about how your body responds to those foods. Robb Wolf offers readers an easy to follow, personal solution of how they can work with their bodies to finally find the foods that are right for them in order to achieve the optimal health they desire."